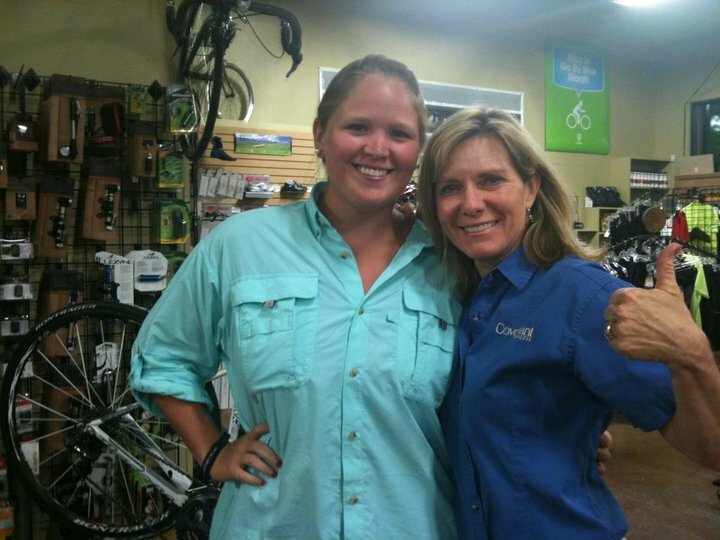 Tonight was Ladies Night Out at Cycology Bicycles, a local bikestore in my area. A bunch of ladies and myself joined Missy Kane to sip some wine (not me), and socialize all while learning more about overall wellness and cycling. I own a Schwinn Trailway but it is not meant for road riding, or God forbid, racing. My friend Brett always harps on me and says “A Schwinn will never win”. It was great to meet other women who have such a passion for cycling and do it on a regular basis both for social reasons and for fitness. The Trek demo girl was there to tell us all about the Trek products and even taught us how to change a tire. I still don’t think I’m ready to jump into road cycling just yet, and it is definitely a hobby that requires some moolah, but I’m going to ease into it and up my mileage on my Schwinn, then hopefully try a roadie sometime soon. I’ll keep you posted. All the ladies took home some sweet Trek goody bags that included Trek water bottles, sweat towels, sunscreen, and all sorts of other freebies. You all know how much I love this free swag. I am super glad I went and met all the fabulous ladies and became more educated about being a cyclist in the future. Maybe cycling will be my next big adventure. H﻿ow about you? Do you cycle or just do the casual bike ride? Me and Missy Kane reppin’ up Cycology. Missy makes me look beastly.